Visiting hours will be Sunday, January 10, from 1-3 p.m. at Morris, O' Connor and Blute Funeral Home, 58 Long Pond Drive, South Yarmouth. When it came to baseball publicity, Joe Sherman was a jack-of-all-trades and did it all with panache and a bulldog tenacity. The 74-year-old Sherman, who served as the Cape Cod Baseball League’s senior writer, editor, league historian and director of special projects, died on Saturday after a long illness. Sherman, a Falmouth, Mass., native, spent several years living in West Yarmouth with son Stephen, daughter Janice Sherman O'Brien, and his wife, Alice, who died three years ago. Sherman also served as Cape League's statistician and publicist in the early 1960s, while also overseeing coverage of the league as sports editor of the Cape Cod Standard-Times. He was a member of the CCBL committee whose efforts brought about the “modern era” of the league starting in 1963, which combined the Upper and Lower Cape Leagues into one entity and began the process of becoming sanctioned by the NCAA, where all competing players would have remaining college eligibility. Sherman was a former editor of the Cape Cod Standard-Times in the 1960s, later worked in television and radio in Worcester and on Cape Cod, and spent two stints on the editorial staff at the Boston Herald. He also did a stint as a minor league hockey executive with the Cape Cod Cubs. He retired 10 years ago as special projects editor after 29 years with Brockton’s daily newspaper, The Enterprise. He rejoined the Cape League in 2006 as website editor and later became coordinator of special projects. He continued to contribute stories to the website and to the league's thrice-yearly publication, Cape League Magazine, and was a member of the league’s Hall of Fame Committee advisory board. “Joe Sherman was the only man that could put a baseball into space,” said CCBL President Chuck Sturtevant. “His knowledge of ‘who's who’ in baseball was next to none. 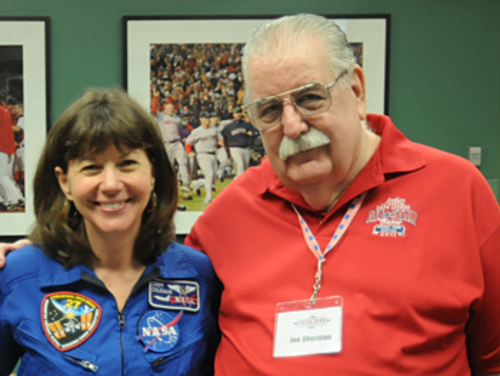 Sherman conceived and oversaw the 2011 “Spaceball” project, which resulted in a Cape League baseball being carried to and from the International Space Station on the Space Shuttle Endeavour by shuttle commander Capt. Mark Kelly. In a moving ceremony that preceded the 2011 Cape League All-Star game at Fenway Park, NASA astronaut Catherine Coleman presented the ball to the family of 9-year-old shooting victim Christina-Taylor Green. “Joe was a one-man show. Let himdo his thing, and he could literally put the Cape Cod Baseball League next to the stars,” said longtime friend and Cape League colleague Dan Dunn. “Joe’s left hand sent a CCBL game baseball on the Space Shuttle. With his right hand, he used that very ball to comfort a grieving family. “Joe found ways to surprise every CCBL veteran I know and honored our colleagues often, but every person he pulled into his projects truly seemed honored to be a part of his amazing tributes," Dunn said. "Some of us were lucky enough to see Joe with his best pal (and son) Stephen building jigsaw puzzles at home. “Talking virtually any sport with Joe was a history lesson. His love of sports, Cape Cod, media relations and his friends and family was always front-and-center. I remember many of us trying to limit Joe to a 'brief' update of his latest special CCBL project. Wouldn't we all welcome just one more Joe Sherman “crazy” idea … and of course, we all know he could make it happen. Joe was one of my best pals in my CCBL tenure. I'll miss you buddy,” Dunn added. One of Sherman's proudest accomplishments occurred in 2008 when he was one of three former Air Explorers who received special recognition at the Cape Cod & Islands Council’s annual Scouters Recognition Dinner at the Elks Lodge in Hyannis. More than 150 Scouts, Scout leaders and friends of Scouting were on hand to see the council present dozens of awards to men and women who excelled as Scout leaders during the past year and to see 23 young men receive their Eagle Scout medals. The highlight of the evening came with the presentation of the prestigious Silver Beaver Award to longtime Sea Scout leader Hugh C. "Tim" Millar. But the most unusual aspect of the evening came when the council completed some unfinished business by honoring three former Air Explorers for their efforts as volunteer firefighters nearly 58 years ago. 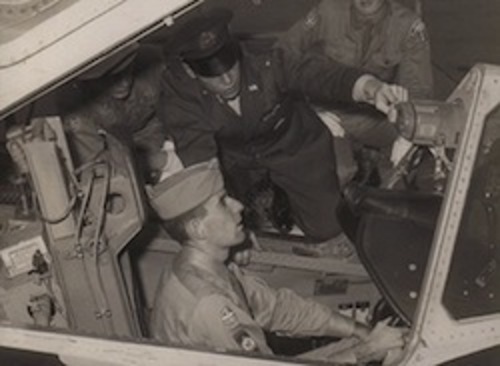 The three – Sherman, of West Yarmouth and William Buckley and George Pelletier, both of East Falmouth – were teenage members of Air Explorer Squadron 45, Otis Air Force Base, on May 8, 1957, when they and three fellow squadron members mobilized to battle a major forest fire in Mashpee caused by the crash of a jet plane from Otis. After that blaze was brought under control, they got word of another, much larger fire raging in the Myles Standish Reservation in Plymouth. Without hesitation, they sped to the state forest, where they were quickly put to work battling that blaze. All told, they spent roughly 20 1/2 hours on the fire lines. The following November, the trio’s exploits were chronicled in a full-page "Scouts in Action" feature in Boy's Life, Scouting's national magazine. But there was no formal recognition on the local level – until the three surviving members of the firefighting sextet were presented with mounted reproductions of the original Boy's Life page plus letters of commendation from Robert J. Mazzuca, Chief Scout Executive of the Boy Scouts of America. When Sherman left the Cape Cod Standard Times in the late 1960s, the person hired to replace him was Mike Curran, who was also actively involved with the Cape Cod Baseball League and together they worked with a young student official scorer from University of Connecticut. “When Joe contacted me about nine years ago, I was so surprised and delighted,” said recently retired CCBL President Judy Walden Scarafile. “I had not seen or talked to Joe in close to 35 years, but here he was on email and phone. He said he’d recently retired from Brockton Enterprise and if we would like another writer in the PR department, he could help out and write a little.